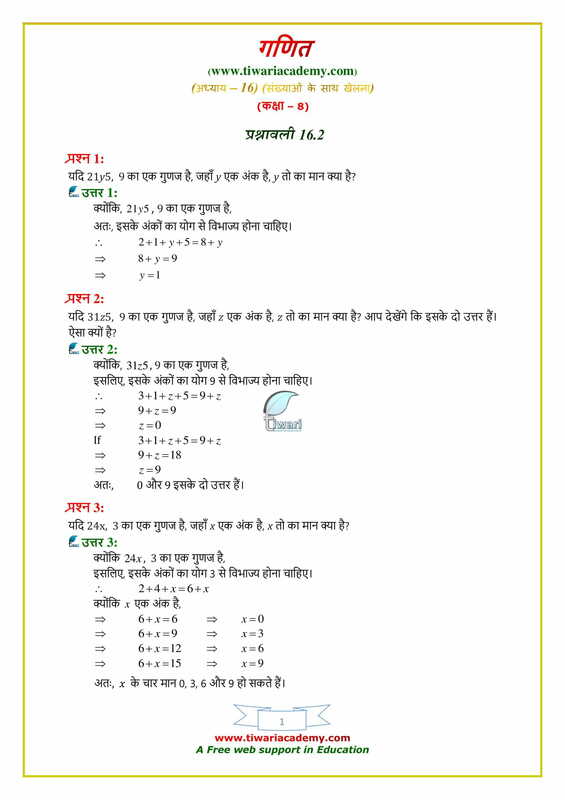 NCERT Solutions for Class 8 Maths Chapter 16 Exercise 16.2 Playing with numbers in English Medium and Hindi Medium free to use it online. All the solutions are prepared by the subjects experts taking care of all steps. If still there is any error, please inform us, we will correct it as soon as possible. 1. Suppose that the division x ÷ 5 leaves a remainder 4 and the division x ÷2 leaves a remainder 1. Find the ones digit of x. 5. A three-digit number abc is divisible by 5 if c is an even number. 6. A three-digit number abc is divisible by 6 if c is an even number and a + b + c is a multiple of 3. 7. 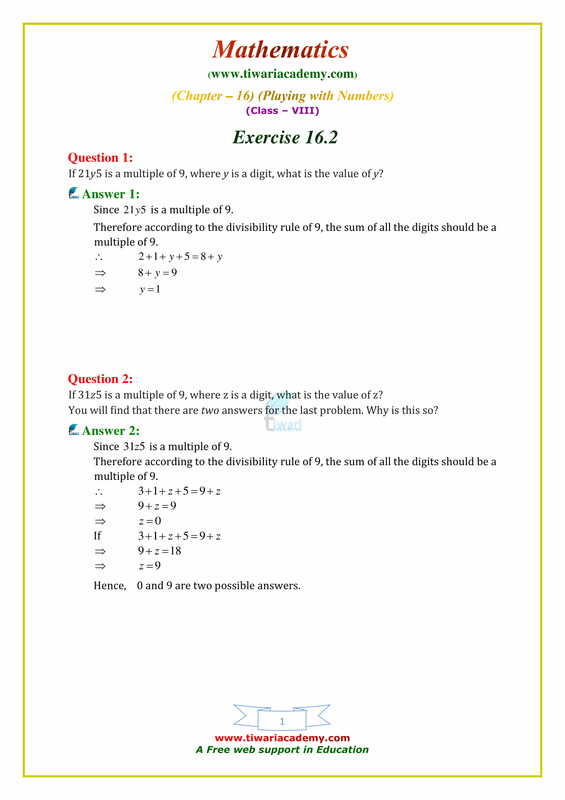 Find the least value that must be given to number a so that the number 91876a2 is divisible by 8. 8. If 1AB + CCA = 697 and there is no carry–over in addition, find the value of A + B + C.
9. A five-digit number AABAA is divisible by 33. Write all the numbers of this form. 10. A three-digit number 2 a 3 is added to the number 326 to give a three-digit number 5b9 which is divisible by 9. 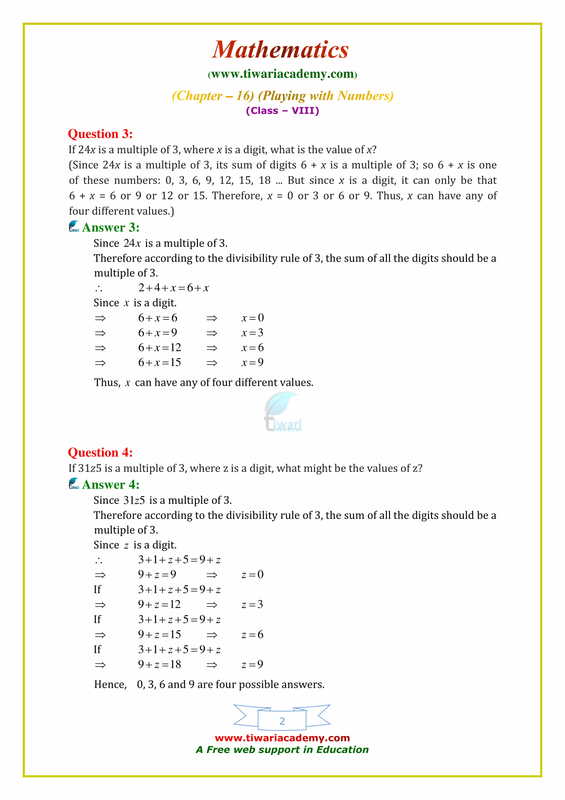 Find the value of b –a.